you will see some horses petuties. hmmmm wonder if I was upset when I sewed this? seriously....do you see a head? me neither. had a partial skein of this camoflage yarn so I decided to crochet a hat. I will try and donate it to caps for kids for the winter. hope I can make some more to go with this one. and here is the rest. with strips left for handles. woot woot! its funny how sometimes you have some projects that just come together like you made them to match. this strip on the side was 15 minutes play and the colors go great with this preprinted panel I found. Here is a closeup of the bag lady. I am thinking a cute tote bag for the beach, for dolls etc,. what do you think? dont think I like this as a border for Sylvester. Quilting Lodge Blog: Quilter's Blog Hop Party Giveaway! 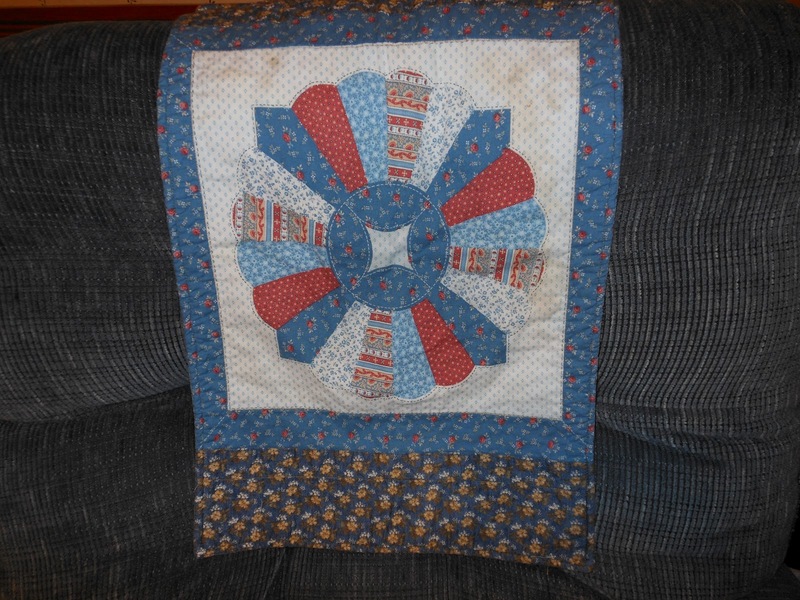 check out the fun on Quilting Lodge blog. . so many great blogs out there to see. Love blog parties! I have been sewing some things for the holidays but some family members "peek" here every once in a while so I cant show you what I have been up to. As soon as I get through a couple of them, I will show you some progress on things you CAN see. I am not too sure about this Vanna thing. Dunkin can not take the long working hours or the many takes required to get just the right photo. he was caught sleeping on the job. I think Dunkin wants to be Vanna White. who me? Vanna? you asking if I wanna be a star? These outer blocks were going to be a hand sewn project for a large quilt. It was started before 9 /11. They have been bagged up long enough and I don't have the time to hand sew any more so they need to become a smaller quilt or a part of a border or another quilted project. maybe on a 15 minutes style quilt? This is a glimpse of the old fashioned print that I am not sure of. sometimes my mind says yes it is old fashioned looking. other times my brain says no.......too busy. I'm gonna tickle you Dunkin! Dunkin seems to like them......but to squirm on not to look at their beauty. These drunken path squares do not go........just had them out at the same time. what would you do? I just want a quick table square with an old fashioned feeling to it. This is a block lotto I got from a friend who won them and knew I loved yellow and blue. I have quite a few of them probably at least 10 in all and dont know if I should make a quilt or small projects. Do you know the block name? It looks like spools and makes a secondary pattern in the corners. I have the dups below these 4. all the squares are one of these variations. I seem to think when I put them together the dusty one at the top didnt play nice and then if I left it in the bright one next to it seemed wrong. I would like to make something useful out of them. My bedroom unfortunately has a bright red carpet and they would not go. what do you think? runners? bags? 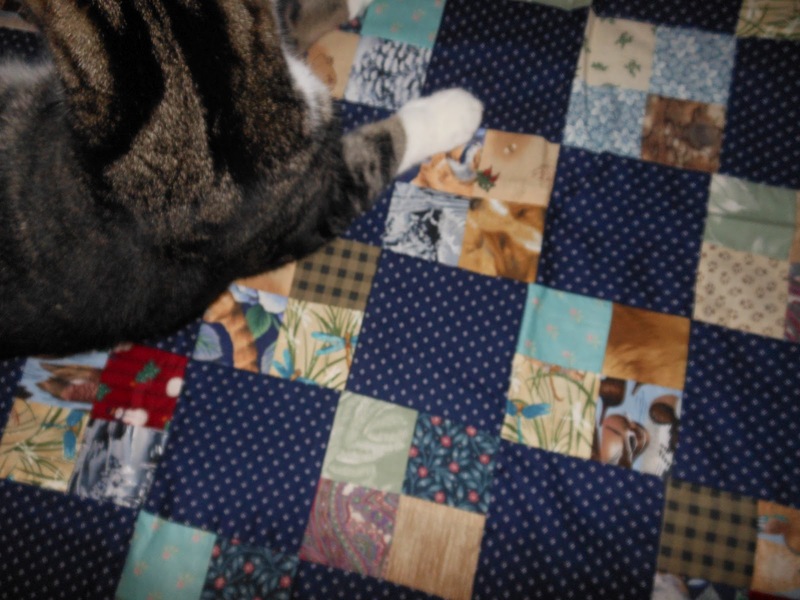 lap quilt and other projects? ooops! NO I cant tell you.......Here she comes.she is watching Dunkin and I like a hawk these days.............afraid we will let the cat out of the bag............whatever that means........ I dont see any bag............and there better NOT be another cat around here! Dunkin is jumpin for joy that the kids are going back to school. he hides when they come over. In his mind they do NOT belong here sharing my time with them. I am HIS mama! 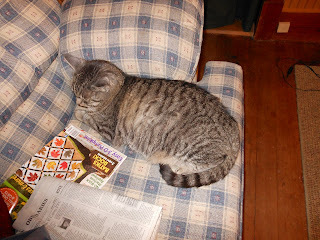 so he was a happy cat when I went back to school shopping with the grandkids. see what I mean? Dunkin is such a buggar. I can not do ANYTHING without him as my shadow! But he is so darned cute! You gotta love him! I found this small lap quilt with strings and hearts that I had started one year. 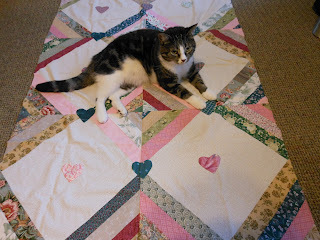 I wanted to donate it as a cancer quilt with a pink border but didn't have enough fabric and yep, you guessed it. Never finished it. I may look for green and some pink and beige strings and try and make a piano key border and be done. 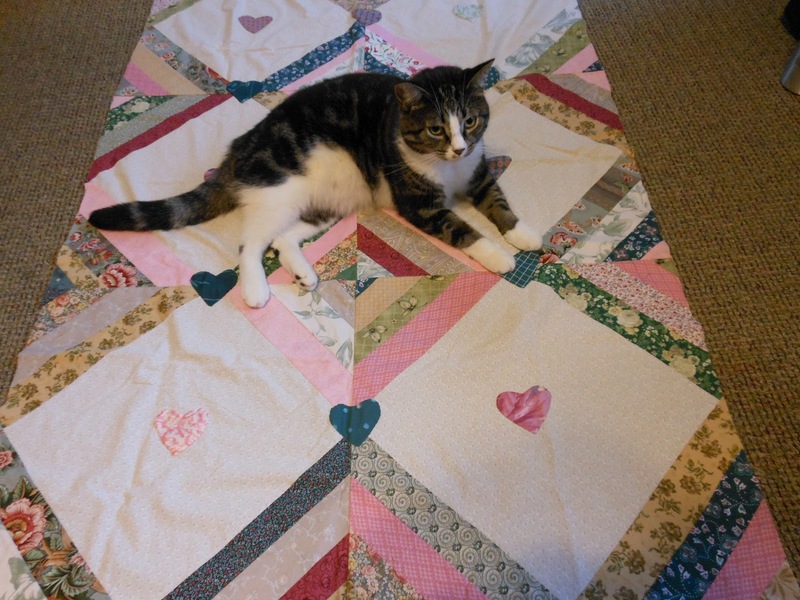 lots of space to handquilt hearts or feathers around the applique hearts. Phoebe is getting into the act of telling me which project to work on. 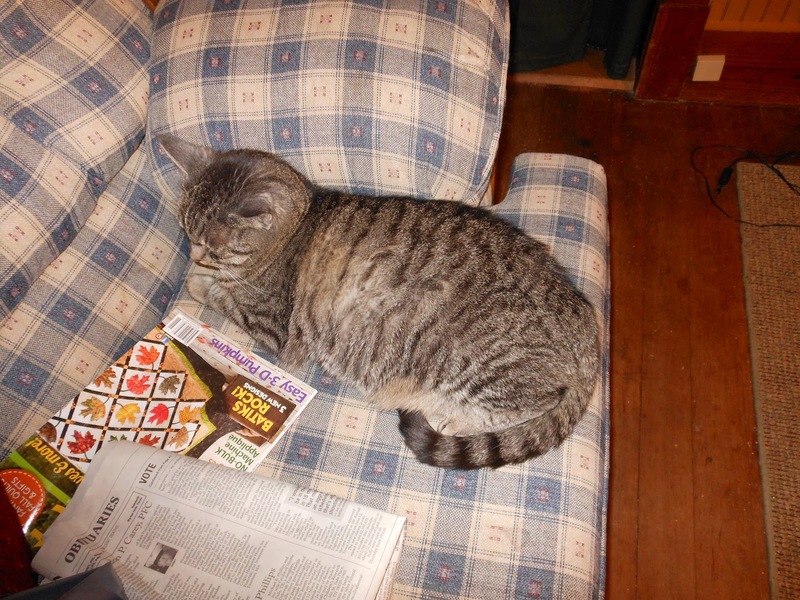 she is "pawing" through my quilt magazines in her free time looking for projects she likes. hmmmmmm.........She is thinking of Fall with the Fall Quilt magazine. silly girl. Or does she know it will be cold soon and wants me to be ready???? This quilt was free. made from discarded all cotton denim weight material. I used to work in a factory that made curtains and bedding and when we closed they gave us some sample books if we wanted them. I took quite a few and tore them apart. 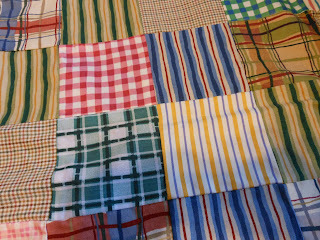 loved the stripes and plaids of these and had enough to make a twin size quilt. 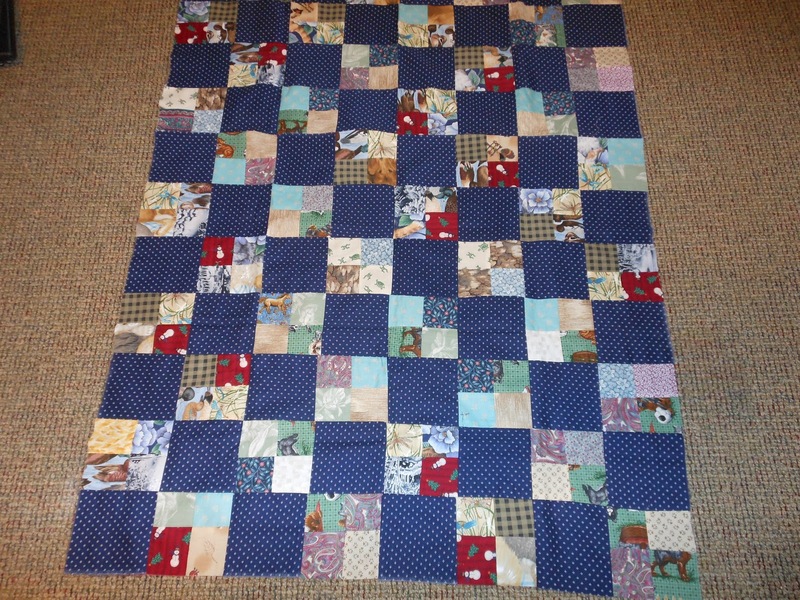 it is still a top as I need to see how I will quilt it. It is heavy without batting. has an old fashioned feel to it. I can picture Grams feather pillows and sleeping under this quilt. ahhhhh............comfort! This is an ongoing project from leftover beige,browns, reds and green yarns. As you can see I have more than one "addiction". Crochet and knit are other passions of mine. 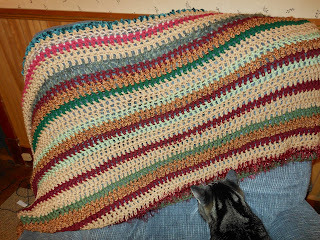 I crochet up a few rows when I get a chance. the row colors are alternated and the yarns are worsted weight and fur and what have you. It has a Christmassy feel so when I get it done it will probably go on the couch for the holiday season. This is a top I made with the Bonnie Hunter method of leaders and enders. I had precut squares and put them in a box near the machine. whenever I sewed, I used these leaders and enders and built 4 patches that I put in another box until all the squares were sewn up. This is what resulted. Now I need to find an appropriate border as there is no more of the dark blue fabric in my stash. 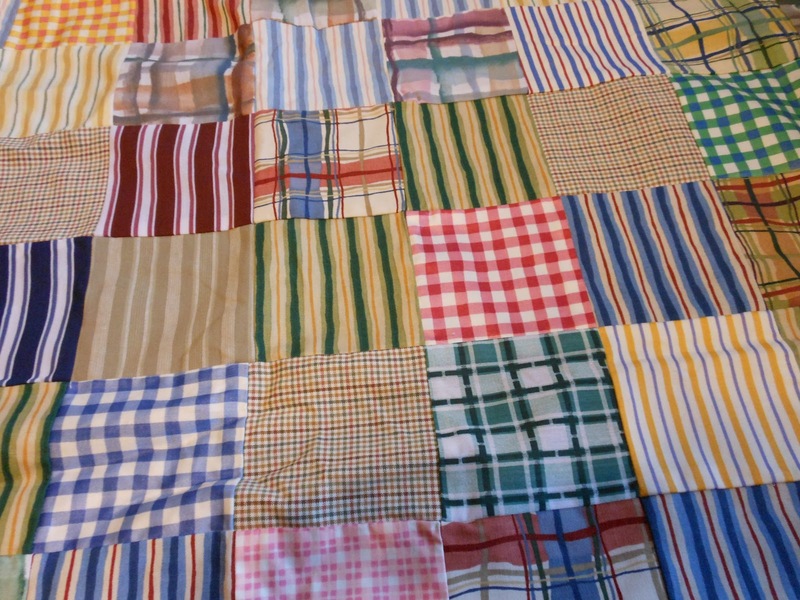 anyone make any tee shirt quilts? 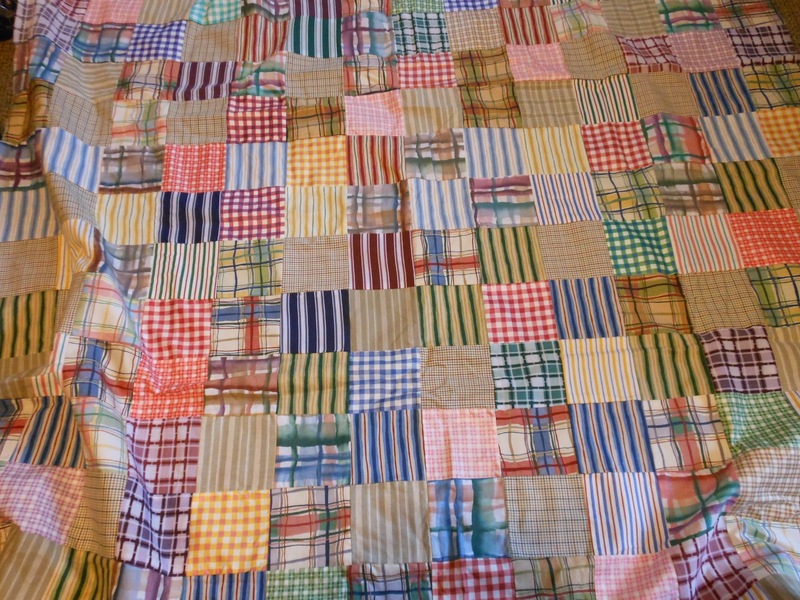 Have any of you made any tee shirt quilts? As you know my brother in law passed away and he was the biggest REDSOX fan you ever met! As a matter of fact he passed away after a baseball game while on vacation with three of his friends. 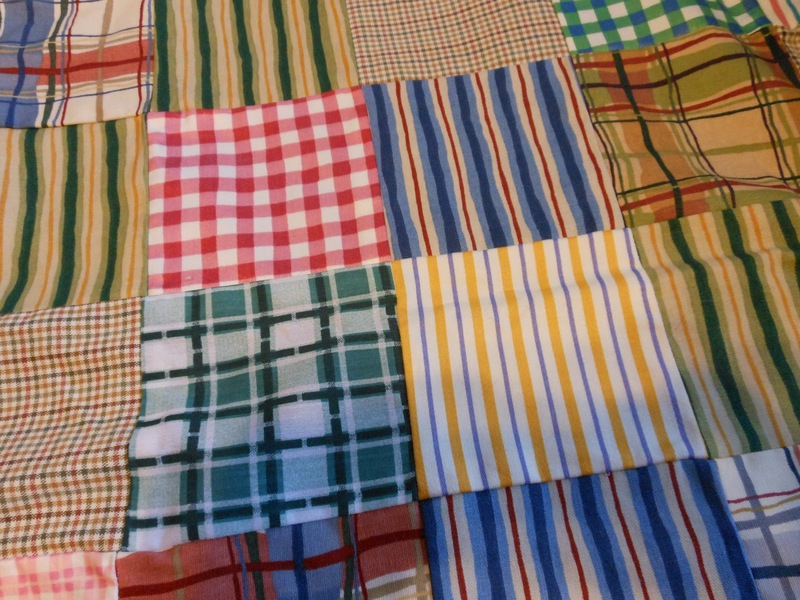 I was thinking of making 3 lap quilts out of his tees and giving them to his friends for being there for him and us as a gesture of our appreciation for all they did. I looked online and googled etc but was wondering if anyone has first hand experience they can share with me. I was thinking of putting some pictures of the 4 of them on fabric as squares etc and maybe the word friend and some of the tees. I know they mix regular cotton to stabalize the stretchiness of the tees. and interface too? let me know some tips if you have ever done this please. I want to start them soon. would you add any more to this duck quilt? there is something that bothers me about it. I am not sure if it is the huge blue border or what it is. Maybe if I add another outside border of blue? It seems like when i look at it the blue border is all I see. I dont even see the duck int he center. Maybe I should outline the duck in black embroidery? add some applique to the blue border to chop it up? this is another UFO that has to GO........red and blue project. maybe a quilt of valor? I need to find more red and blue and make the ducks into larger blocks I think...........or surround them with alternate blocks of strings in red and blue? what say you? 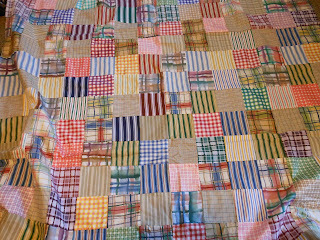 Was thinking of making some kind of boy baby quilt with this one. This square is about 18 by 30 ish as it is. Maybe a row of some black and white stripe or checks and then another scrappy blue border will do. Will see when I play in the scrapbox what comes out...........Do you like to play in the scrapbox? Worse case scenario he becomes a baby bib too! thinking babies lately. (no not me.......silly goose) I want to be prepared for boy or girl with maybe quilt, bibs, crochet hats etc. I would rather pick out things from a "baby box" that are all done than stress out over gifting. Besides, it is fun to create for babies. Do you like linky parties? I do. it is a great way to meet new quilting friends and see what they are up to. These are next. I have probably 10 or so of these. I like the old fashioned feel of them. I have a print fabric that would be just enough for 4 squares to be appliqued. 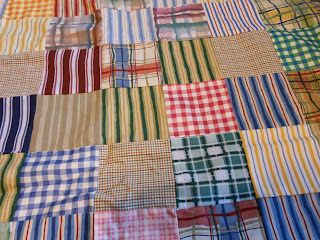 With some borders I think it would make a nice table quilt or small baby quilt. I will try and find that piece and let you see if you agree. I normally dont mix too many prints. but it had kind of an old fashioned feel to it. decisions, decisions or is that dresdans, dresdans! this is what it started out looking like. It was originally just the rail fence pattern that was going to be a quilt. Over the years it lay unfinished and I was "eh" about the colors so it stayed unfinished. I then "found" dresdans and made some using some of the fabrics in them to match. I am in love again! so I put one with the rail ends as a runner to see how I would like it. any ideas what I can do with more dresdans in this colorway? should I try a 4 dresdan table topper? maybe a runner with two dresdans, one on each end? 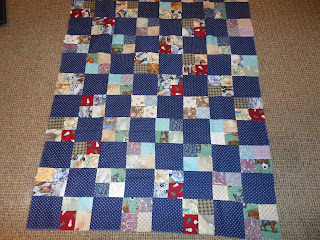 Is it too dark for a baby quilt? should I let them rest and see if they can become a medalion quilt center? I believe I have 6 or 8 more dresdans. what are your thoughts? How cute is this? 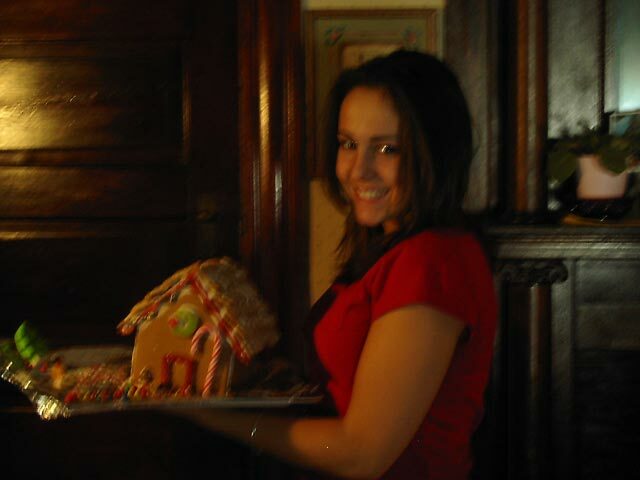 A niece of mine and her gingerbread house. When the nieces were little the 5 of them and I had an annual tradition of making gingerbread houses. The girls were so creative and as they got older would outdo each other. One had a see through fish pond with goldfish, another had a teddy bear graham snowball fight scene in the yard complete with mini marshmallow snowball stashes. One had her mom order candy rocks and made a gorgeous rock house. another had a chalet type roof with teddy grahams hanging in the design. they went from decorating the houses to "auntie we need a bigger tray so we can decorate the yard" (complete with candy cars no less). LOL such fun memories. Now this little one is all grown up with a little one of her own to start this fun tradition with. One also has mimicked my "Christmas box" where I shop year round and put the item in the box to help defray the cost of it all in one month. It seems funny to hear her say I got this for my Christmas box for so and so.Do you think she will like it? my Christmas wish for everyone..........spend time with family and friends doing something fun and making memories. it is the best Christmas gift you can receive. Barbara you are the winner of my drawing! send me your address in an email so I can mail out your prize. anyone ever make one of these? this is not my quilt. I found the image somewhere on the internet and kept to make later "when I have time" LOL I love the colors even though they are not "my colors". It is so cozy looking and Fallish. I have a giveaway to celebrate my 1000th pageview! isnt the internet fun? Leave me a message to be entered and I will send a fun surprise to the winner. I will have either Dunkin or Phoebe (or hubby) pick the winner out of a hat from all the entries. I have no idea what I am doing with my hands. LOL too many girl scout cookies maybe? I am on the left. my brother is next, my cousin holding my younger brother, my sister, then my cousin. This was back in the day when you sat in the visiting parlor. We had four kids then. (my mom had 5 total) but I remember batman and selling cookies to the family for girlscouts and having fun playing croquet with my cousins. we didnt have a set but I loved to go there and play the game. 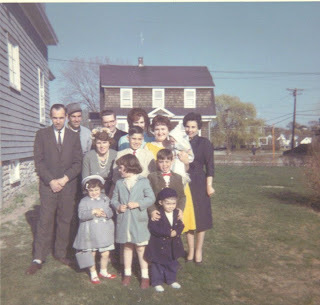 We also got to walk to the beach f rom their house in the summer. something we couldnt do on the farm where we lived. funny as you talk as an adult you find out things. My cousins always thought we were luckier because they loved coming to our house and riding the pony and petting the bunnies and animals. just proves that humans are always thinking they could be happier someplace else. We should be happy where we are today and now and enjoy while we can! this is a picture from my past. It was taken at my favorite Uncles house. 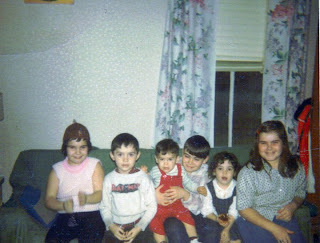 I am in the front on the left. The short one. hee hee. My mom is in yellow dress holding my sister and my dad is in the back with the hat. My brother is the cutie pie in the front row.